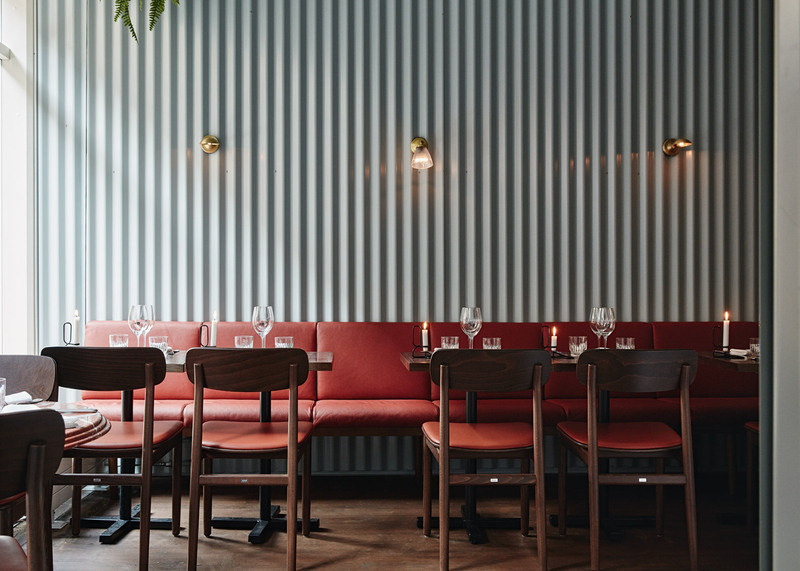 Finnish designer Joanna Laajisto has combined mint-coloured corrugated metal wall panels with red-orange marble furniture inside this restaurant in Helsinki. Laajisto overhauled the space for the OX restaurant on the city's Pieni Roobertinkatu street, and used the menu to influence the interior design. "The biggest inspiration for me was the food the chefs wanted to serve at OX," Laajisto told Dezeen. "They really didn't want to categorise the food in a specific way, but described it to me as classic European with some North African influences – classic with contemporary twists." This contrast is what inspired Laajisto to combine corrugated metal wall panelling in a soft pastel colour with red-orange leather sofas and marble tables. The rippled metal walls, which are based on a visit to an old slaughterhouse, provide acoustics for the restaurant – meaning that no acoustic panels needed to be added to the ceiling. "Many years ago I attended a private diner at an old slaughterhouse where was a long table set in a room with unfinished corrugated metal walls," she said. "Candles were the only source of light and the acoustics were wonderful." "Ever since then I have wanted to use corrugated metal panels to create a soft, atmospheric environment," she added. "Corrugated panels work as a great acoustical element so no acoustical ceiling elements were needed at OX." Before it became OX, the space was a steak house for more than 40 years. When redesigning the restaurant, Laajisto aimed to create a new type of atmosphere, while still being able to fit 39 seats into the relatively small space. She moved the kitchen to be in the middle of the room, a feature that she refers to as "the heart of the restaurant". A marble-topped counter table accommodates single diners, while a combination of round tables made from rust-coloured marble and rectangular wooden tables can seat larger groups. Laajisto designed all the sofas, tabletops and fixed furniture herself, but the chairs and bar stools are by Thonet. For lighting, glass ceiling pendants by Swedish Rubn are used to create a "dim mood". "And as the restaurant is called OX, the owners wanted to use some horns in the decor," said Laajisto. "I found a perfect way of doing that with a 1950s vintage table lamp by Louis Kalff that sits on the bar with its horns." Laajisto also designed the interior for a nearby restaurant in the Finnish capital, which she based on 1940s kiosks. Photography is by Mikko Ryhänen.